A popular notion in China is that, the bittier the food, the more healthy it is. This popular concept of belief influences many parts of Chinese culture, primarily the Chinese cuisine and many traditional Chinese medicines. China’s heavy emphasis on herbal ingredients on both cooking and medicine shows their bias towards bitter ingredients in health related concerns. I will be delving into this notion and hopefully peek into the nooks and crannies of this argument. Many naturally bitter foods are indeed healthy. Examples include: arugula, bitter melon, brussel sprouts, coffee beans, cocoa and more. Bitter vegetables tend to pack more anti toxins and also more vitamins than non-bitter vegetables in general. Bitter foods also seem to be more easily digestible and helps to move things along in the bowel area much more swiftly. Bitter plants have had a long medicinal history and has been used to cure many problems in the past. Quinine for example is a compound that comes from cinchona bark thats been used to cure malaria in Africa, long before modern medicine was invented. Medicinal leaves and herbs were also grounded to be applied on physical wounds to speed up recovery times and prevent infection as earlier versions of ointments. 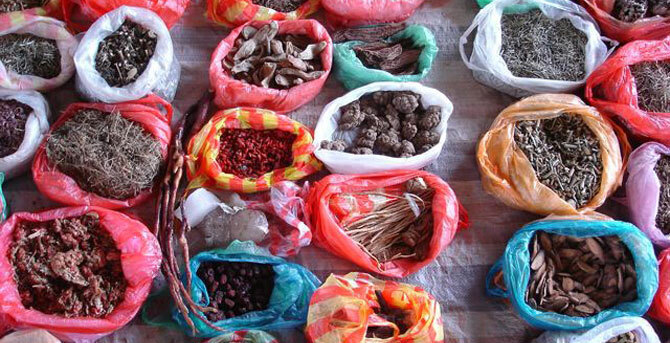 Traditional Chinese medicines have also been used in many parts of Asia to cure many different problems such as fevers and stomach aches.Chinese medicine called “Zhong Yao” (中藥) is widely used even today. It involves the heavy use of bitter herbal plants, and herbal remedies to cure complex health problems such as diabetes. This type of medicine is extremely popular in several parts of Asia, namely China, Korea and Japan. Its a very primal way to approach things, and have been growing popularity for a while. In conclusion, through the premises that I have presented, the statement that bitterness is healthy is not valid, but the premises are true. Bitterness, may correlate with healthiness, but correlation does not mean causation. Bitterness itself is an abstract taste that humans originally developed as taste receptor to recognize faulty or poisonous foods, it was not a biological mechanism that developed to recognize more nutritious foods. However, it just so happens that bitter foods tend to have more nutrients. Eating bitter foods is definitely a habit to incorporate into a healthy and balanced lifestyle, and if you are incorporating a lot of bitter foods into your diet currently, I would continue doing so! Hi David, I hope you are having a fantastic day! I really enjoyed your topic because I have never quite thought of this subject before and I agree with all your premises and conclusion. I am very happy that you took the time to research your premises to be able to support and back them up. Do you think that more medicines with bitterness vegetables incorporated are going to be used in the future? I do like how you agree with your premises but not conclusion based on the knowledge and research you have. I also really enjoy the images you have incorporated into this blog, they are eye catchers that make me people want to read your blog. One question I want to leave you with is, do you think that too much bitterness of vegetables in our diet can harm us? Thank you for your blog post, and allowing me to learn more about this research I have never been told, it was awesome to read! WHATS UP DAVID. I was scrolling down and your post caught my eye because first of all, its an interesting topic. I grew up in a household where my parents are very strong on Chinese medications and they are always telling me “Oh, Chinese medications are the only medication that works the best” but i never believed them and at the same time i questioned, what was it about Chinese medication that makes it so special..? Until i came across your post, i have a better understanding that bitterness is a form of healthiness in medication and Chinese people incorporate bitterness to their medication which makes it “special”. I never saw having bitterness in your food as a source of “nutritious” or “healthy”. To me, bitterness is just an “ugh get it out of my mouth its probably moulding or expired taste”. I loved reading your post because of the facts you stated that backed up your premises.